Soup, Our Food | Food It Yourself! I used my noodle for this picture. I work at a local independently owned and operated hardware store. I usually have to work Sundays. So, on this particular Sunday, I got up a little earlier than usual and got it all started. I sweated the onions. 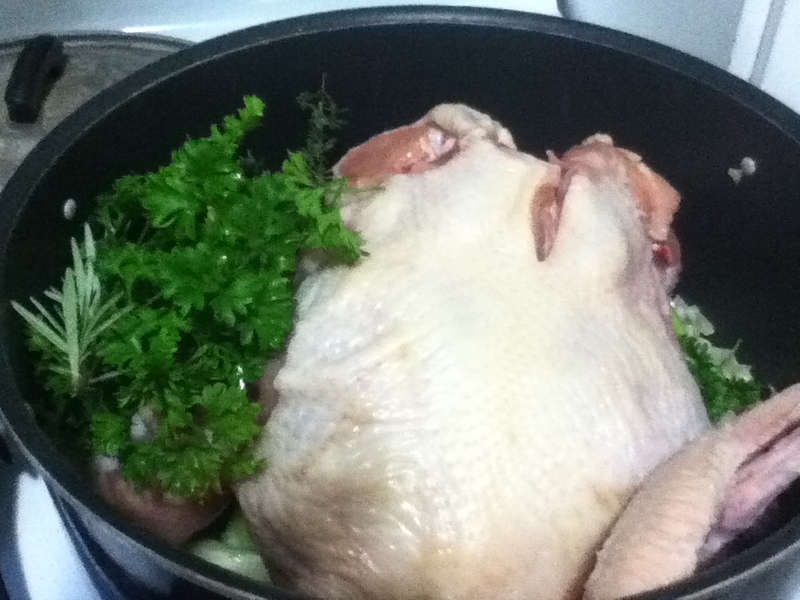 I added roughly chopped celery and carrots and a few sprigs of herbs. Yes, the herbs I used included thyme. The chicken I selected is from a local farmer who is also my husband’s boss. The chicken grew up on Woodstock Sustainable Farms. These people are serious about chicken, and about good food in general. Next, the pot needed water and a long simmer. But the people of Central Massachusetts needed paint mixed and screens repaired, so I left the pot in the fridge and headed to work. 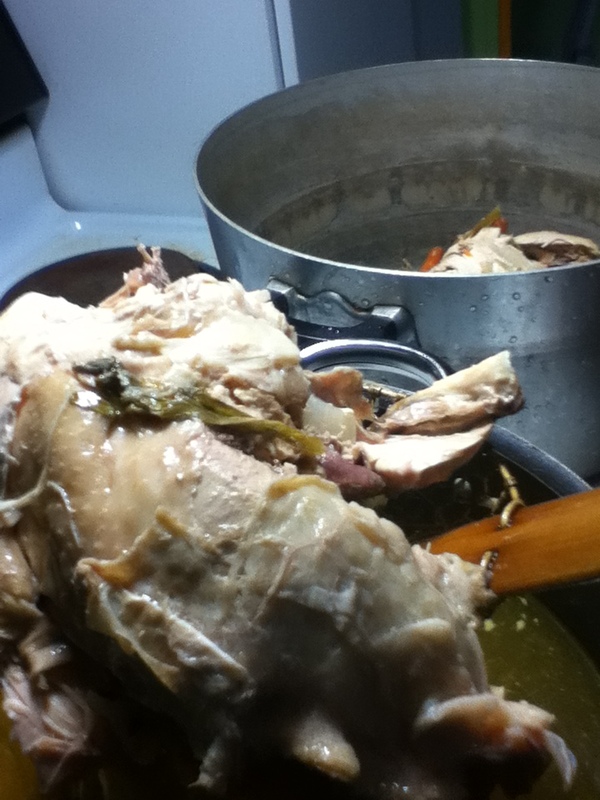 When he woke up a while later, Mr. Food It Yourself added the water and set the pot to simmer. There was no hurry- the first few steps were done. He poked at it every once in a while. When I got home, I removed the solids from the broth and, after a little cool down, skimmed the fat off the broth and cut up the meat. Until you try soup made from scratch you cannot even imagine how amazing it is. We had a lot of left overs too, so our team work will go extra far! Ever have leftovers with a can? Didn’t think so. I know I keep harping on getting other people to help you with your DIYet. There is a reason for that. We all have a million and two things to do every day. Sharing food preparation with others makes homemade meals easier. So give it a try! Plan out who will peel, who will chop, who will monitor the stove and who will set the table. It is absolutely worth it. It was even better the next day. I swear it’s part science (all the flavor compounds diffusing evenly and whatever) and part magic. Soups, tomato sauce, even meatloaf is better reheated the next day. 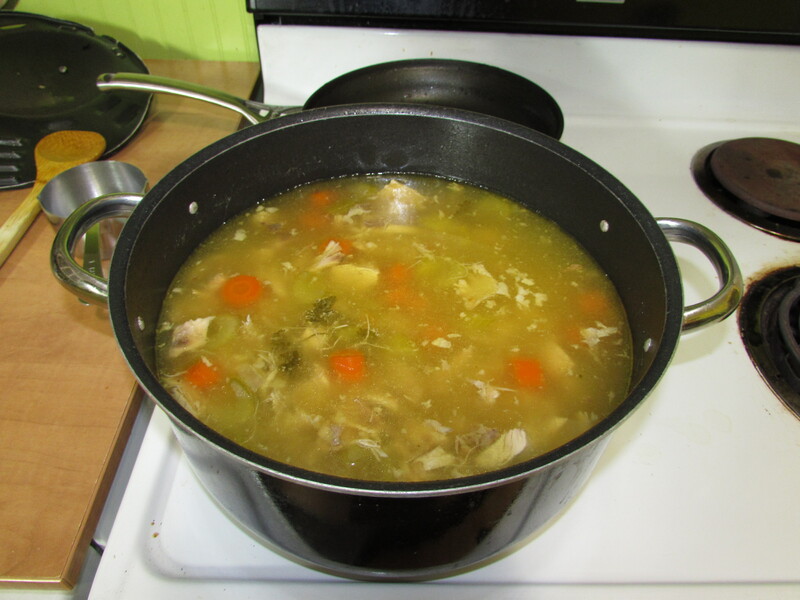 Pingback: Making Soup with Our Pastured Chicken- A food blogger blogs us! Pingback: Timeless in No Time | Food It Yourself!